These Healthy Blueberry Oatmeal Muffins are perfect for on the go! Loaded with whole grains, fiber, protein and juicy berries! This recipe was first posted on The Recipe Critic. As much as I love Christmas, I always secretly get so excited when the tree comes down, the decorations go away, and LIFE GOES ON. January is the perfect time to reset, get back into creating and maintaining healthy habits, and quietly reconnecting as a family once the hustle and bustle dies down. 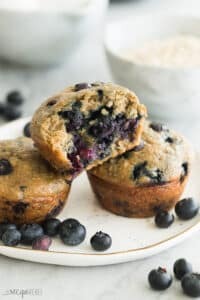 These healthy Blueberry Oatmeal Muffins are the perfect breakfast or snack for getting back to routine. 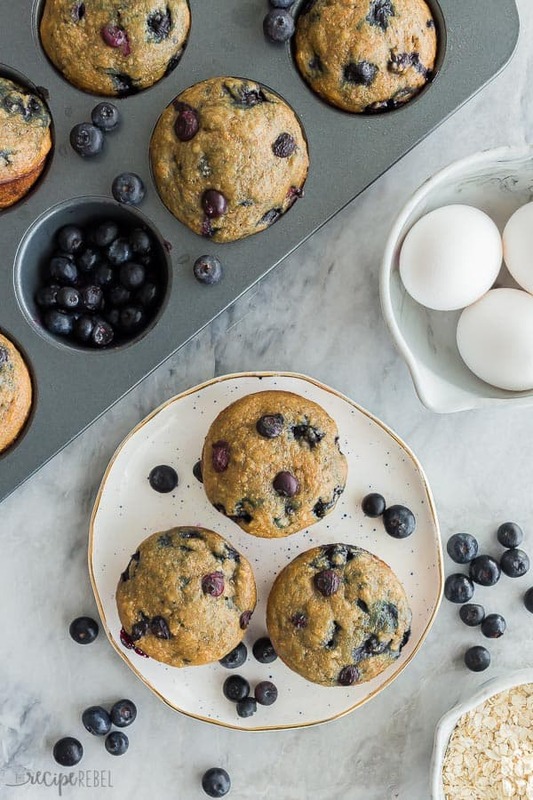 What’s so great about these Blueberry Oatmeal Muffins? They are loaded with good things. Oats offer so much goodness in such a small package: fiber, protein, iron, zinc (great for boosting that immune system!) and on and on and on. There’s also whole wheat flour, Greek yogurt, eggs, and blueberries which are bursting with antioxidants themselves. Call me a strange, nutrition-obsessed geek (who also regularly enjoys a bowl of ice cream or slab of cheesecake…), but I love seeing how much goodness I can cram into one small package. This is especially great because I know my kids will down muffins like there’s no tomorrow. There’s no snack or breakfast prep, they can just grab and enjoy and that I love (knowing that the bus is going to be at the end of the driveway all too soon!). These muffins can be stored on the counter at room temperature for 1-2 days. After that, I really like to put them in the refrigerator or freezer. To refrigerate: place in an air tight container and store in the refrigerator for 5-6 days. To freeze: place in an air tight container and freeze (stacking them is fine!) for up to 3 months. To thaw, simply remove a portion of them and place on a plate or in a small container, and let thaw at room temperature for 1-2 hours, or microwave on low for 1 minute. You can swap out the fruit here if blueberries aren’t around! I prefer to use frozen blueberries because they are inexpensive and great any time of year, but chopped apples or cherries, or other berries will work just as well! You can make this recipe dairy free by swapping out the yogurt for dairy-free yogurt or additional applesauce. You can use rolled oats in this recipe instead of quick cooking, but I prefer the texture of quick oats. Rolled oats will just have a more noticeable texture. Steel cut oats will not work in this recipe. In a large bowl, whisk brown sugar, yogurt, applesauce, oil, eggs and vanilla together until smooth. Add flour and berries and stir just until combined -- don't overmix! 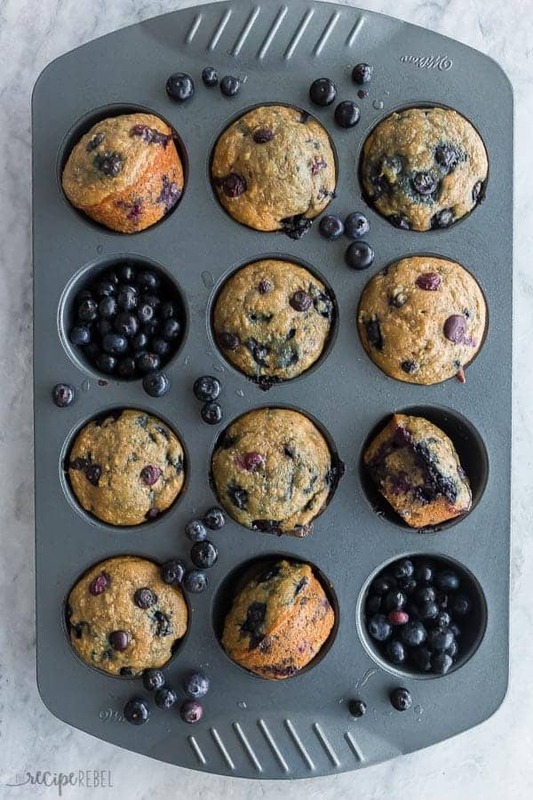 Lightly grease a muffin pan and fill 24 muffin cups 3/4 full and bake for 20-25 minutes until a toothpick inserted in the center comes out clean. I would do the same amount as the Greek yogurt you’re replacing, yes, plus the original! Just took them out of the oven…delicious! Thanks Joyce! I’d love to hear how you like them!